Rep. Tom Ryan, businesswoman Marianne Williamson, Mayor Pete Buttigieg, Rep. Beto O’Rourke, Pres. Donald Trump, Sen. Cory Booker, Mayor Julian Castro, Rep. John Delaney, Rep. Tulsi Gabbard, Sen. Kirsten Gillibrand, Sen. Kamala Harris, Gov. John Hickenlooper, Gov. Jay Inslee, Sen. Amy Klobuchar, Mayor Wayne Messam, Sen. Elizabeth Warren, Gov. William F. Weld, businessman Andrew Yang, Sen. Bernie Sanders, and Rep. Justin Amash(source). 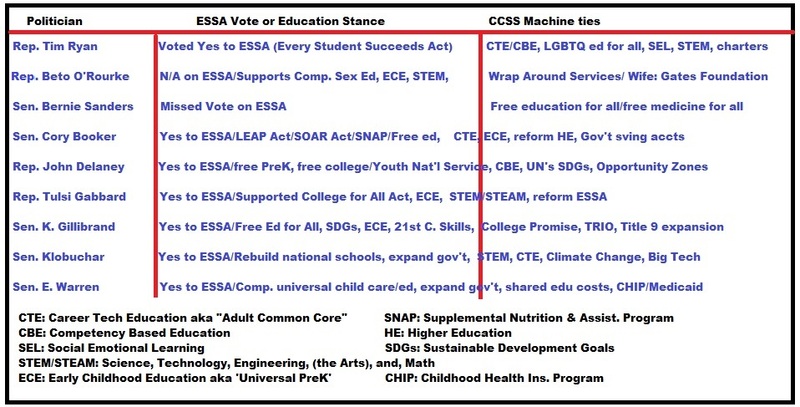 What ties to the CCSS Machine do these people have? Biden(LGBTQ education for all, Big Labor/Unions, CTE); Swalwell said ‘yes’ to ESSA; Bennet also said ‘yes’; Moulton said ‘yes’ and has added green jobs, STEM, and CTE to his stance; Kerry is tied to the Clintons and received campaign donations at one time from (then, citizen) Donald Trump. Sen. Warren currently has co-sponsored a dozen education-related Bills. Sen. Booker and Klobuchar share co-sponsorship of S 461(see above). Sens. Harris and Klobuchar share co-sponsorship of S 523(see above). Sens. Warren and Harris share co-sponsorship of S 851(see above). Sens. Harris and Klobucar share co-sponsorship of S 758(see above). Sens. Booker, Bennet, Harris, Sanders, and, Klobucharshare co-sponsorship of S 768; Sen. Warren is the sponsor (see above). Sens. Sanders, Klobuchar, Warren, Booker, and, Harris were among the Senate co-sponsors of S 461 which seeks to improve education outcomes for HBCUs (Historically Black Colleges and Universities). The Bill has passed the entire Senate and is now in the House’s Education and Labor Committee. In 2017, I showed you how HBCUs were being targeted by the Ford Foundation (CCSS Machine member)for STEM. Senator Bennet is the co-sponsor of S 381 which would amend the HEA for NASA (STEM) based resources. He also is a co-sponsor of S 876 which will provide STEM jobs for our military veterans. Bennet is also a co-sponsor of S 317 and S 468. S 317 will amend the Social Security Act to increase children’s mental health in wraparound services. S 468 will require schools to partner with mental health services.